The tablet industry might be going downhill, but this does not mean that it is about to close its shutters anything soon. Nay! In fact, there is still a sizeable market out there where tablets are concerned, with Apple’s iPad range taking a huge chunk of it, while Android has its fair share of devices from notable manufacturers as well as lesser known factory names. Mattel, a name that is associated with toys all this while — Barbie dolls especially, has come up with the Barbie Tablet. Yes, you read that right. 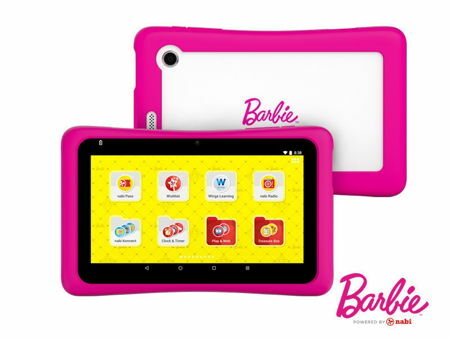 The Barbie Tablet that will be powered by nabi, in addition to a Hot Wheels tablet as well as an American Girl tablet. The Barbie Tablet will arrive chock full of digital content, experiences, not to mention a fair number of accessories to go along with it in an attempt to capture the imagination of the younger market. This particular effort will merge the high-tech quality and exclusive features that parents have come to expect from a nabi tablet. Some of these include advanced technology components and software, not to mention the revolutionary Blue Morpho OS overlay which delivers a robust line-up of over 400 kid-focused features. It will enable kids’ imaginations to run wild as they race cars around the track with Hot Wheels, “Be Anything” with Barbie, and get creative with their favorite friends from American Girl. Regardless of which particular model that you choose, all three of them will arrive later this October for $79.99 a pop. With the Barbie Tablet, you can “be anything” from fashion designer to superhero. There are dozens of Barbie-themed apps, games, and videos, not to mention a custom pink bumper, fun Barbie sound effects that come alive as you unlock the tablet, among others. Other hardware specifications of these tablets include a 7” display at 1024 x 600 resolution, a quad-core processor, 16GB of internal memory that can be further expanded via a microSD memory card slot, and Android 6.0 Marshmallow.